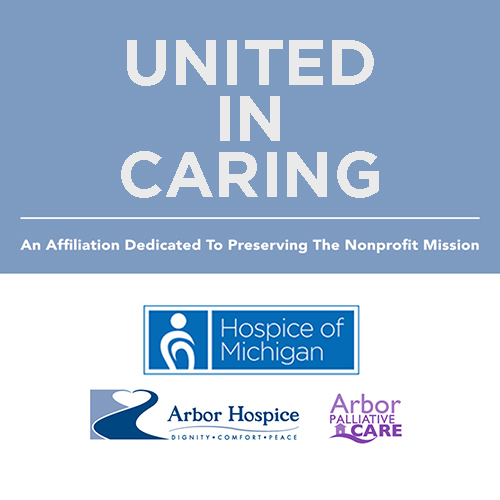 We are excited to share that, effective January 1, 2016, Hospice of Michigan and Arbor Hospice & Palliative Care will form an affiliation. This joining of our like-minded, mission-driven, nonprofit organizations will allow us to better serve patients and families while helping to strengthen and expand the future of nonprofit hospice in Michigan. This affiliation will create synergies while retaining independent identities, preserving what is unique and best about each of our organizations. In today’s constantly changing healthcare environment, our affiliation will unite us in caring for our communities by aligning our missions and sharing best practices. 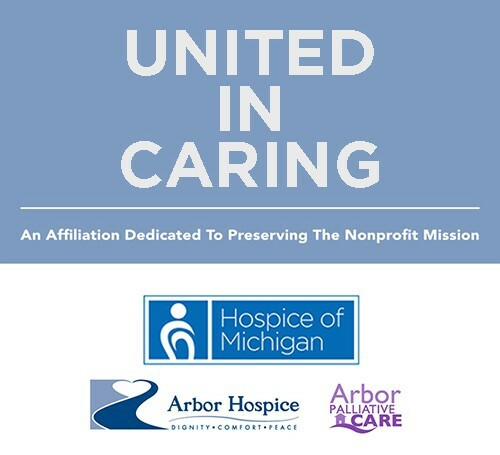 The affiliated organization will continue to operate as Arbor Hospice & Palliative Care throughout Washtenaw County and its current service area, as Hospice of Michigan will continue to operate throughout the state. Both organizations will provide patients and their families with the same quality, compassionate care the community has come to expect, including the availability of Arbor’s residential hospice inpatient services. Collectively, Arbor and HOM will provide hospice and palliative care services on a daily basis to more than 2,200 patients throughout Michigan. More than 700 members of our combined care teams, supported by more than 900 volunteers, will help ensure patients and their caregivers receive the highest quality of care as they face the end-of-life. Together, we will offer the broadest range of palliative, pediatric and hospice programs, as well as complementary music, pet and massage therapies. There are still many details to work through as we move forward with our affiliation. But, we can assure you that some things will not change: most notably, there will be no disruption of service to patients and families served by either organization. Care teams will remain intact and will continue to deliver the highest quality care available to patients at the end-of-life.